I love my gear and would hate to drop it… I also love Peak Design. Those little anchors are awesome. Snap on, snap of… have them on all my cameras, still or video. Now it seems Peak are having some problems. Some seem to be prematurely wearing out and failing. Out of a million anchors they soldt they have seven reported cases. But accourding to Peak, it’s seven to many! If you are worried that you may have some of the V3 anchors, take the survey and get som new V4 anchors. Do you have Peak V3 achors? Check and get free replacements! They’re the little connectors that come with all Peak Design camera straps. WHY DID WE UPDATE OUR ANCHORS? This is actually the 4th time we’ve updated our Anchors, meaning that our new Anchors are actually version 4 (or V4). We began making V3 Anchors in August 2017, which featured a thinner cord that could fit directly in smaller camera eyelets. In Spring 2018 we got a few reports (7 total) of V3 Anchors prematurely wearing out and failing. To put things in perspective, we’ve sold over 1 million V3 Anchors, so the observed failure rate is 7 in 1,000,000 (or 1 in every 17,000 users). Though small, this failure rate is unacceptable for us and hence we’re updating our Anchors to prevent this issue from happening to anybody else. HOW DO I GET UPDATED ANCHORS? If you purchased a strap before June 5, 2018, take our Anchor Update Survey to see if you quality for a free Anchor Update Kit. Starting on June 5, 2018, all straps purchased at peakdesign.com will come with a free Anchor Update Kit. We’ll automatically include it in your shipment. Note that Clutch will not come with an Anchor Update Kit, because Clutch contains a version of our Anchors (V2) that has the same durable cord as our new V4 Anchors. 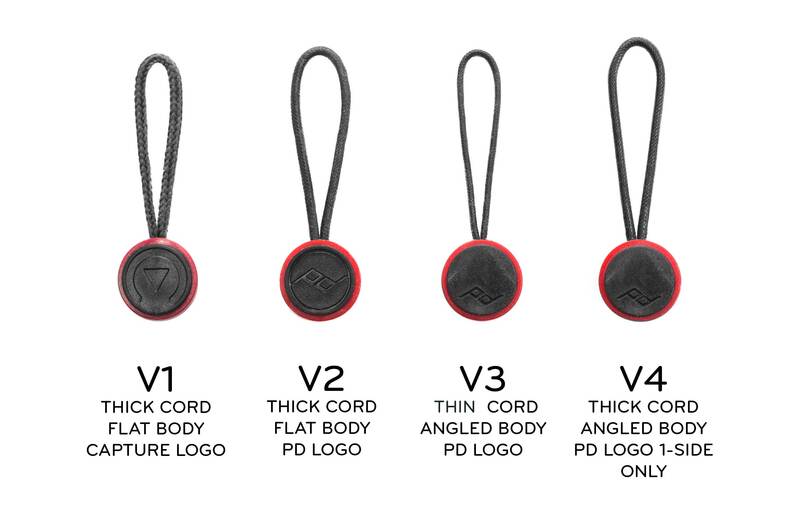 Eventually all Peak Design straps will contain new V4 Anchors. We will update this article when that happens. WHAT’S THE DIFFERENCE BETWEEN V1, V2, V3, AND V4 ANCHORS? We test all products, including our Anchors, extensively. When testing fails to anticipate an issue, there is always something to learn, and always an intense rethinking of our testing methodology. In this case, our biggest learning was that we failed to account for the variance in camera eyelet construction. Through our investigation we discovered that the inside of camera eyelets—the little metal strap loops on camera bodies—vary in sharpness far more than we originally observed. We’ve now seen this variance both across brands/models and within the same brand/model. Even if we had tested every camera model, we didn’t anticipate manufacturing inconsistency within models themselves. Of the premature wear cases we’ve seen, most were due to friction between the eyelet and the Anchor cord. We always can and should improve our design and testing processes. This issue has helped to improve our testing methodology for all existing and future products. Our reputation is built on the functionality of our products, the security of your cameras, and the transparency with which we conduct business. We hang our hat on your trust—that we’ll keep your gear safe, and that we will always do right by you.